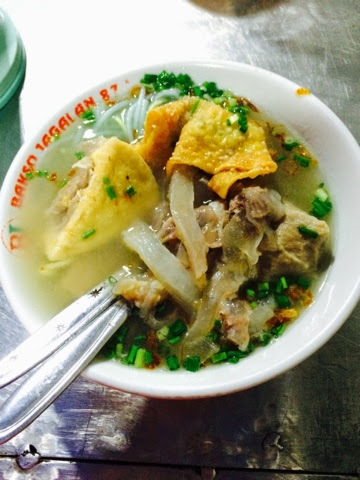 When it rains in Surabaya, I actually really want to eat warm meatballs soup. Meatballs I want to eat is Bakso Jagalan 87. The first I used to eat here because I just want to eat meatballs soup or bakso in list of Indonesian food. 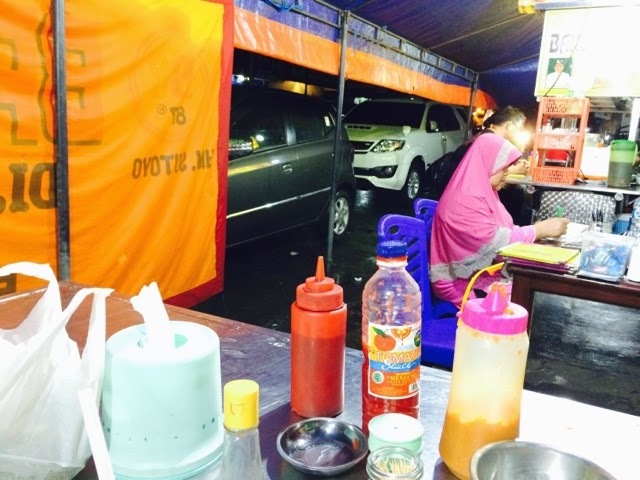 I heard Bakso Jagalan 87 food stall was famous with it taste. And it is really true even the price maybe caused you shock. The price was pretty pricey when you compare it with other meatball place. I've been so long wanted to eat this again but because some condition my wishlist not yet accomplished. When it finally happen, it was a long rainy day in Surabaya. When I got there, the place was crowded as well. There are still many cars pulled over and popped into the meatball place. Although this meatball place is in front of regular stores that closed in the night, like most other stalls that lined the Jagalan area. I ordered a half serving of bakso kikil or meatball mix with part of cow legs, my husband ordered half serving of regular meatballs. There are two types of portions that offered, jumbo and a half servings. The type of meatballs itself there are has several kinds regular mix (meatballs, tofu and fried shumai), regular meatballs mix with kikil (part of cow legs) and regular meatball mix with ribs. Kikil that I ordered with mix meatball poured into the bowl is not just a few, there is soo many kikil in my bowl. Picture is above, you can see it clearly. A half portion like we ordered is actually not recommended if you want t eat here because the price difference is not much when we compare with jumbo. But because me and my husband have eaten dumplings first so our tummy can't accommodate many more food. Jumbo serving itself is more like a meatball in a very big bowl instead of regular bowl. Even if you have not eaten all day long, you can be more than satisfied enough when you eat Jagalan 87 jumbo serving meatball. A half serving of meatball mixed with kikil cost me approximately 50,000 (I do forget the exact price) and the jumbo set jus IDR 65.000. So if you stopping by in Bakso Jagalan 87, please not that you should not bring not much money because the price was premium and we don't know when the owner will raised the price. Expensive? 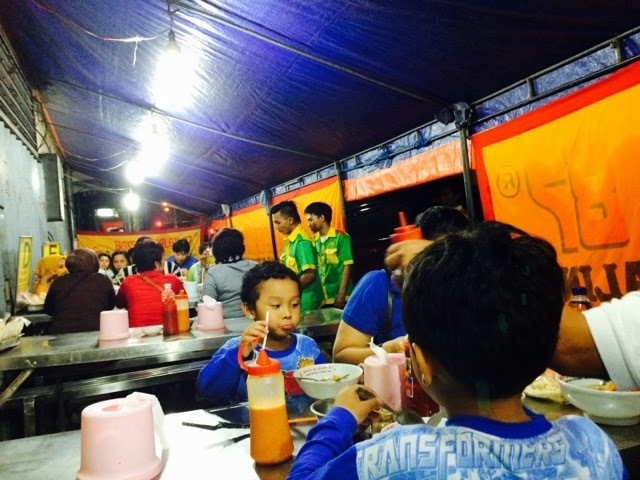 It is expensive when compared with general meatballs food stall in the area of Surabaya. But in my opinion who often watched tv investigative cases, relatively comparable to guarantee 100% halal food and contain no chemicals that were displayed in the banner. Although, according to husband opinion, he believe it's way too expensive. This meatball stall is open when evenings. Although many people think it was so expensive but for meatball stall that in front of closed store, this place was quite crowded and the customers kept coming.